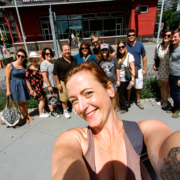 Brewery Creek Walking Tours are returning for Spring and Summer! Explore the beautiful Brewery Creek area of Vancouver on foot with a guided Walking Brewery Tour! Along the way, your expert brewery tour guide will share interesting facts about the Vancouver craft beer scene, and also about the iconic Brewery Creek neighbourhood you’ll be strolling through. On your Brewery Creek Walking Tour, you’ll visit 3 craft breweries in just over 3 hours, each located in the historic Brewery Creek neighbourhood of Vancouver. The meet up location will be the 1st brewery on tour. At each brewery we’ll take you through the “Staff Only” doors for behind the scenes tours where our knowledgeable guides take you through the brewing process from grain to glass and introduce you to story of each brewery. Questions are welcome! From there you’ll be treated to VIP seating and enjoy plenty of craft beer samples and laughs with new friends and old. Our brewery tour guides are all passionate members of the craft beer community and take great pride in connecting you to our local craft beer scene. Your walk, from start to finish, will be approximately 1.5 kilometres (1 mile) with a moderate level of incline. Meet Up Location: Your guide will meet you at the main entrance of your first brewery on tour. Wednesday 2pm to 5.15pm and visiting Brassneck Brewery, Faculty Brewing and Big Rock Urban Brewery & Eatery. More on these breweries here. Visit our online booking calendar and book a Walking Brewery Tour of Vancouver now! Long before it evolved into the beer geek mecca it has become today – a neighbourhood which hosts many of the city’s finest up-and-coming breweries, including Main Street, Brassneck, and more – Brewery Creek was the heart of turn-of-the-century Vancouver’s vibrant local brewing scene, a name given both to the district, and the river which gave it life…by Jesse Donaldson for The Westender. Read the full story here. https://vancouverbrewerytours.com/wp-content/uploads/Walking-Brewery-Tours.png 667 1000 Ryan Mackey https://vancouverbrewerytours.com/wp-content/uploads/logo-sm-300x60.png Ryan Mackey2016-08-30 11:42:002018-10-01 17:01:44Brewery Creek Walking Tours are returning for Spring and Summer!